One of the biggest mistakes that an Ann Arbor homeowner can make is to assume that their landscape won’t be in need of maintenance during the winter. This line of thinking is understandable; after all, what’s the point of taking care of your lawn when it’s just going to be covered in snow? The thing is, you’ll want to make sure that your landscape is ready to withstand the harsh winter season so that it makes it to the spring season in as healthy a shape as possible. Otherwise, you’re going to be in for a lot of work to get your landscape back to its original beauty once spring rolls around. You should consider signing up with a winter services contract from a professional landscape company. Not only will this help ensure that your landscape is properly prepared for the winter, but it will eliminate the risk of trying to protect your lawn at the last minute before an expected snowfall. Doing so is risky since many of the resources you might need, such as salt, may be sold out at this point. Mulching your soil – Mulching your perennials might be a good idea. Doing so can help prevent your soil from being continuously warmed and frozen, which can damage certain plants. Mulching can help to prevent fluctuating soil temperatures. Pruning trees and shrubs – Pruning your trees and shrubs before winter hits can help to protect them. They’ll be less likely to experience damage as a result of heavy snowfall if they are properly pruned, and they will also be less vulnerable to infection and disease as a result. Winterizing your irrigation system – If you don’t winterize your irrigation system, it will likely experience damage during the winter that will be expensive to fix. You will need to shut off the water supply to your irrigation system and drain the pipes to prevent it from freezing. Any existing water in your pipes could freeze should temperatures drop low enough, and this could cause your pipes to burst. Don’t forget to drain your hoses and to bring them inside. Cut your lawn – While you won’t be able to mow your lawn once it begins snowing, the last time you are able to, you should make sure you cut the grass so that it’s two inches long at the most. If your grass is any longer than two inches by the time it begins to snow, then the grass will be flattened by snow or frost, which will cause it to bend over and retain moisture. This increases the risk of mold growth and damage being caused to the roots of your grass. Fertilize your lawn – Fertilize your lawn towards the end of fall. This way, your soil has the nutrients it needs to last the winter. It should also help to encourage lush growth once spring comes around. Seal cracks in the driveway – If any cracks have developed in the concrete of your driveway, then they should be sealed before it begins snowing. If water enters the cracks, it could freeze if temperatures are low enough, causing the cracks to grow even bigger. Evaluating your landscape’s condition prior to winter – We will perform a thorough inspection of your landscape before winter hits in order to determine what condition it’s currently in. We will look for potential issues that could worsen as a result of the winter season as well as identify what needs to be done to completely winterize your landscape. This will help to prevent the damage that a harsh winter could potentially cause. Additionally, we can also put down stakes so that when you have snow cleared from your property, your landscape won’t be damaged by accident. Plowing snow from your driveway – If you have accumulated at least two inches of snow on your driveway, then we can plow your driveway for you. We will clear any snow that’s accumulated up to three inches from your property or any outdoor structures. Just keep in mind that we schedule our appointments based on our existing schedule, future weather predictions, and current weather conditions. Clearing your sidewalk and garage space – Plowing every space outside your property isn’t always possible. It’s why we will come to your home and shovel snow from your walkways and driveway all the way up to your front door so that it’s easy for you to come and go without being slowed down by a pile of snow. De-icing your exterior spaces – The formation of ice can pose quite a danger to anyone who comes onto your property. The last thing you want is for anyone in your household–or for any guests–to slip and fall on an icy patch on your sidewalk. This can cause serious injuries, after all. We can de-ice your sidewalks, driveway, walkways, porch, and more to make your property safe to use. 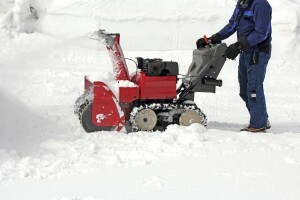 Removing snow – We can remove any snow that collects on your property. 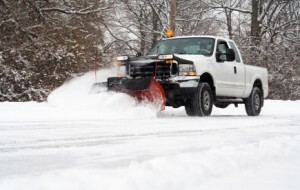 We charge an hourly rate for snow removal services and will use a number of techniques (including plowing or shoveling) to remove the snow depending on the size of your job. Don’t put off preparing your landscape for the winter. By entering into a winter services contract, you won’t have to worry about being improperly prepared for the harsh weather conditions that winter brings. It’s worth noting that homeowners who decide that they can winterize their landscape on their own will often find themselves waiting until the last minute to do so simply because they may not have the time available. When this happens, they are likely to find a shortage of resources available to them. For example, the Detroit area is already dealing with a critical salt shortage. Fortunately, a professional landscaping company will have collected enough salt by the time winter hits to be able to service all of its customers. For more information about our winter services, be sure to contact us at Twin Oaks Landscape in the Ann Arbor area today.